My dear departed mother left a trove of priceless memories. She remains the best self-taught cook I’ve known – a kitchen magician who could transform things ordinary into a feast for angels. All moms are special and all things possible begin with them. Alabama’s tough and crusty coaching legend, Bear Bryant, always ended his weekly television show with a command: “Call your mama!” He meant each day. My stylish mom loved to cook and entertain. Gardening was a passion, and she glowed with beauty and strength of character. Her favorite hobbies were family and friends. She loved flowers and chocolate. Mother’s Day is nearly synonymous with springtime, and the wines served should mirror the grace and vibrancy of new life, fresh flowers, and the harmony of songbirds. Each sip should suggest fresh fruit, fragrance, and the softness of a loving hand. Wines for her should never be harsh or experimental, but instead reminders of things beautiful, a subtle promise that tomorrow will bring continuity and all things will get better. What we give her comes back in multiples. Arugula, with shaved fennel and Parmesan salad with Champagne vinaigrette is enjoyed with their Chenin Blanc. The main course is herb roasted breast of chicken drizzled with balsamic reduction, accompanied by fruited Orzo pasta with Roma tomatoes, Mandarin oranges, dried currants, golden raisins, and scallions tossed in a citrus vinaigrette with Gremolota zucchini, along with generous pours of Fall Creek’s velvety Merlot wine. Dessert is lemon meringue tart accompanied by the Auler’s Twin Springs Sweet Red. Lecia Duke, the acclaimed Fredericksburg, Texas chocolatier remembers her mother by serving her French Chocolate Silk Pie (see recipe and photo below), a recipe that has been handed down for generations. Ms. Duke, a legendary Lone Star State businesswoman, recommends a late harvest Riesling wine, found in abundance in nearby Hill Country wineries. Mother’s Day should showcase gentler wines that go with almost all food, some standing alone as an aperitif like Riesling, either from Germany, Alsace, or from New York or Washington state. Riesling from the Texas Hill Country where German heritage is pronounced, is often spectacular. For German Riesling, be aware of the label which is determined according to harvest ripeness. A Splatlese is made from fully ripened grapes and may be dry or even off dry. Kabinett is usually dry and light-bodied and is the style usually served with food. Chianti is an easy-going red wine. A Classico will cost a few bucks more, but mom is worth it. If lamb is on the menu, regal Bordeaux is always going to work well. There is no need to be extravagant. Some Bordeaux are less than $20 dollars and they will be well received. Bordeaux is always a good choice as a Mother’s Day gift. The feast for Mother’s Day should include dessert and a dessert wine can steal the show. From late harvest to ice wines, the list of selections is vast. They all taste wonderful and add enormous pleasure as we celebrate mom. Recipe courtesy of Lecia Duke, acclaimed Texas chocolatier. Photo courtesy of Pillsbury.com. Lecia says, “This is a traditional “wink-of-the-eye-ice-box” pie! This recipe comes from the French side of my family – my mother’s recipe. 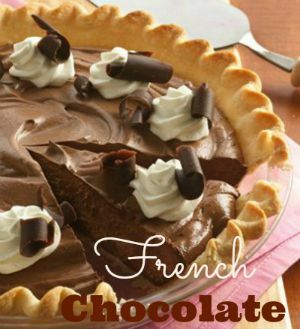 The French are known for their rich sauces and delectable decadent desserts, and this pie does not fail in that regard! Slice it in small delicate portions. It also is magnificent as a “tassie” – small miniature tarts where the pie crust is baked or pressed into a mini-muffin pan. Pairing with a wine is what makes it all worthwhile (and healthy too). * Learn How To Melt Chocolate. In the bowl of your mixer, cream the butter approximately 1 minute. Add sugar, 1/4 cup at a time, and continue to beat approximately 3 to 5 minutes or until light and fluffy. Using low speed of your mixer, slowly add the melted chocolate and vanilla extract to the butter mixture until the chocolate is well blended and the mixture is smooth and creamy. Add the eggs one at a time, beating well after each egg before adding the next egg. Pour the prepared chocolate mixture into either a baked pie shell or graham crack crust (your choice). Refrigerate until set. Served with prepared whipped cream, chocolate curls or shaving, and/or roasted pecans. I just made this pie. Now I am wondering if it is a safe recipe with raw egg in it? It is not a cooked filling. I would recommend purchasing pasturized eggs for this recipe to reduce the risk.